How tall is your RV? Are you including the AC unit on the top? Or that new satellite dish? Solar panels you just installed? 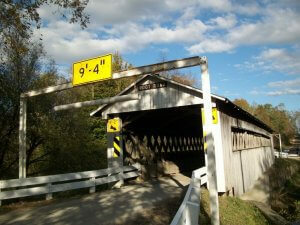 Is that bridge really the height the sign claims? 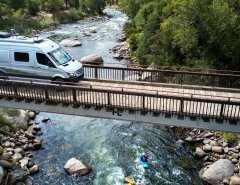 Let’s go over some RV tips so that the next time you approach any low-lying bridges and overpasses, you’re sure you won’t sheer off the top of your home-on-wheels. Nothing will ruin your day faster than the instant you realized that your RV was too tall to fit below the bridge you just went under. 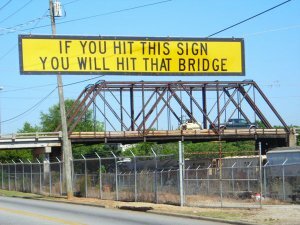 Understand that every state is different as to whether they mark the height of bridges or not, or whether that sign posted is accurate. 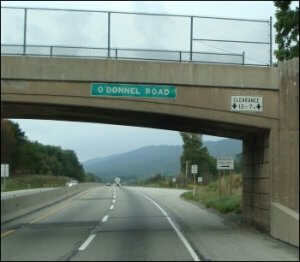 The Federal Highway Administration sets bridge clearances at 14-16 feet, unless a special design exception is obtained. There is no Federal maximum height regulation on commercial motor vehicles. However, remember that states have their own restrictions. According to Heavy Haul, state laws in the eastern half (not east of the Mississippi but rather from the Minnesota-Dakotas state line south plus Oklahoma) have maximum heights of 13 and a half feet, while the western half have maximum height at 14 feet. Colorado and Nebraska have maximum heights of 14 and a half feet while Alaska has 15 feet tall maximums. As a result, most tractor trailers are 13.5 – 14 feet tall. 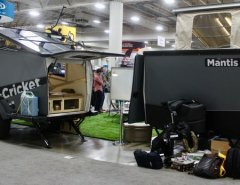 RVs are not commercial motor vehicles subject to federal size regulations. Even though there are no RV restrictions at the federal level, many states have laws or regulations that apply to RVs. In Georgia and many other states, the restrictions don’t distinguish between commercial vehicles and non-commercial vehicles. Just because the federal bridge clearance is set at 14 feet doesn’t mean that it is actually 14 feet. Repaving can lower bridge clearances by 2 inches each time it is repaved. That’s a significant amount. And local and state bridges don’t have to abide by the federal regulations. So there are many that will be significantly lower, particularly the further you get away from major commercial areas. The most important thing for you is to know how tall your RV is. Don’t rely on manufacturer’s numbers or the owners manual. Instead, get up there on the roof and measure it yourself. Make sure that you find the highest point to measure from – not the roof of the RV, but rather the top of the AC or satellite dish. Or any other tall thing you have up there on the roof. Only trust the measurements you take. Print out a label and put it on your windshield (like those service and oil change reminder stickers) or on your dash. This way you are not relying on memory when you come across a clearance sign. You’ll know whether you can fit or not. *Tip for Fifth Wheelers: Remember to measure when your RV is hooked up to your truck. You want to know what the RV clearance height is when you are driving, not when you are parked. Many GPS systems, especially the common RV versions, have many low clearance points programmed in. According to Low Clearances, most GPS units have only about 1,500 pre-installed clearance restrictions. Their Route-1 product has 7,000 locations in the US and is compatible with most GPS units, as well as Google Maps and several other mapping services. No matter if it means going miles out of your way, you’ll still be better off than a costly repair bill for your AC, satellite dish, your RV roof or worse. When you see a clearance sign, don’t ignore them. They are there for a reason and that is to protect you and your transport from harm. And because those signs may not have been updated after the last repaving job, take six inches off the clearance level. That’s SIX INCHES LOWER than what the sign declares. Also, note that various bridges have different clearance signs for different parts of the bridges. 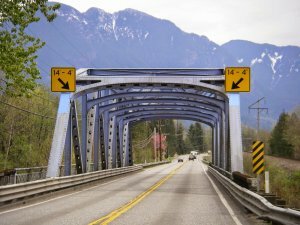 The middle of the bridge usually has the highest clearance level, but in mountainous areas it may be one side or the other. Go with the highest clearance area for your safety. If there is a bridge that you’ll just barely fit under and you don’t have any other option, go SLOW. Take a deep breath and move like a sloth under that bridge. By going slowly you’ll avoid unexpected bounces from uneven road surfaces that might have you grazing or hitting your roof. And don’t be surprised if you do have to back out and find a different route. Be prepared with safety equipment such as flares, neon triangles, etc., if you get stuck even before reaching the bridge. You may need extra notice to other drivers that you need to back your way out of potential disaster. Any damage you incur, will be your fault. Unfortunately, that’s the reality. The authorities won’t care about your excuses if you hit a bridge. Your RV’s height comes with special responsibilities. Businesses won’t be understanding if you hit their awnings. Do NOT try to go through an ATM or fast food drive-thru. (We won’t even go into what mistakes people have made getting stuck trying to make that sharp drive-thru turn. )When it comes to most gas station canopies, they “usually” have at least 14’ of height to their canopies. But not always. 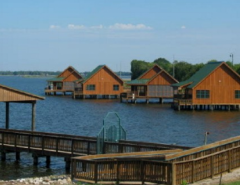 Banks, fast food restaurants, and many other businesses often do not provide enough clearance for large RVs. Giving a wide berth within parking lots is usually a good idea. And don’t forget your insurance company; keep your rates low by knowing what your RV clearance is and avoiding any mishaps. Previous Article Don’t You Ever Get Lonely?